Reid appears to have been initally content with the numerous and sturdy J36 goods locomotives built by his predecessor, Holmes. 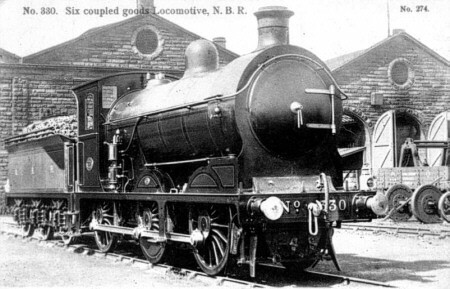 However in 1905, the North British Railway (NBR) directors decided that it was time for a range of more powerful locomotives. This resulted in the introduction of the C11 4-4-2, D32 4-4-0, and J35 0-6-0 locomotives in 1906. Although smaller than the passenger C11s, the new J35 goods locomotives still managed to cause a sensation due to their larger size and higher boiler pitch compared to the J36. The first eighteen locomotives were built with outside admission piston valves located beneath the cylinders. The next six engines were built with traditional slide valves between the cylinders. The slide valves proved to be operate better in service, and all later locomotives were built with slide valves. The piston valves were not converted to match. In total seventy six J35s were built in ten batches between 1906 and 1913. Four batches of ten each were built by the North British Locomotive Company. The remainder were built at Cowlairs. The first two locomotives built at Cowlairs were built with fireboxes that were four inches shorter than the other J35s. They also had a different boiler tube arrangement that resulted in a greater heating surface. These two engines also had piston valves and were classified as J35/2 by the LNER. The remaining piston valve engines were classed as J35/1, and the slide valve engines were all classed J35/3. One of the J35s (probably No. 329) was fitted with an experimental Phoenix smokebox superheater in 1911. The trial also included D29 'Scott' 4-4-0 No. 897. The trials were unsuccessful, and both locomotives had their superheaters removed. Two J35/2 engines lost their original short firebox boilers in 1924 & 1926. Receiving standard saturated boilers, they were re-classified as J35/1. The entire class was superheated between 1923 and 1942. The long period of conversion was due to the fact that a superheated boiler was only fitted when a saturated boiler wore out. Superheaters were of the Robinson type. The first five engines to be superheated were initially recorded as receiving Schmidt superheaters, due to the use of boilers taken from J37s. It is possible that this is incorrect and the boilers in question had already been converted to Robinson superheaters. Early superheated boilers were fitted with three lock-up safety valves, but most were fitted with two Ross pop safety valves. From 1937, the superheated piston valve engines were classified as J35/5, and the superheated slide valve engines were classified as J35/4. The J35s were initially allocated to long distance goods duties, and could be usually found at the main terminal sheds. Over half were allocated to St. Margaret's, Eastfield, Carlisle, and Dundee. From 1914, the J35s were displaced from the best goods duties by J37s. From this time, the J35s were used increasingly for coal traffic and pick-up goods. During the summer, they could also be found on some main line passenger duties, especially between Edinburgh, Glasgow, and Fife. By Grouping (1923), the J35s could be found at St. Margaret's (17), Dundee (13), Eastfield (11), Thornton (9), Bathgate (7), Carlisle (5), Perth (2), Kipps (2), Dunfermline (2), Stirling (2), Haymarket (2), Parkhead (2), Polmont (1), and Berwick (1). Withdrawals started in 1946, but only six were withdrawn before Nationalisation (1948). By the time of British Rail (BR) ownership, the J35s were being used on local goods and mineral workings. BR paused the withdrawal programme until 1958. Withdrawals were much more rapid this time, and the last J35 was withdrawn in December 1962. Heating Surface: Total: 1748 sq.ft. 1794 sq.ft. 1748 sq.ft. Firebox: 143 sq.ft. 133 sq.ft. 143 sq.ft. Grate Area: 19.8 sq.ft. 19.25 sq.ft. 19.8 sq.ft. None of the J35s survived into preservation. DJH produce a whitemetal kit of the J35 for OO gauge (4mm scale). Connoisseur Models sell an etched brass kit of the J35 for 7mm scale (O gauge). Thank you to Malcolm Peirson for the photograph of NBR No. 330.